How do we help others while taking care of ourselves? How can we say “no” and set limits with compassion? How do we set limits while staying connected in our relationships? It’s easy to think that being kind and compassionate means that we have to be available to everyone, 24/7, and do whatever it is they ask of us. We feel guilty about saying “no” or valuing our own needs. As a result, instead of feeling open and compassionate, we end up feeling resentful, stressed, and burned out. Is this really the meaning of compassion? 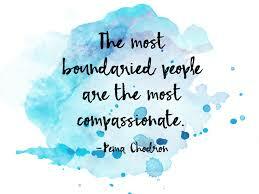 How can we set boundaries compassionately so that we can hold ourselves with care while helping others? real Bodhisattva training for real life. This daylong workshop will include lecture from both teachers, meditation, Q&A, discussion, and interactive exercises. We will draw from Buddhist meditation techniques and philosophy and the practices of Nonviolent Communication. Participants will gain insights and skills that will allow them to become truly effective helpers, in order to work for the liberation of all beings. This workshop is appropriate for beginners as well as long-term practitioners who want to explore this important topic. Vegetarian lunch included with registration. Registration limited to 30 people. Venerable Tenzin is authorized by the FPMT to teach at both the foundational and in-depth levels, and is also a teacher of Cultivating Emotional Balance (a secular program developed by Alan Wallace and Paul Ekman). 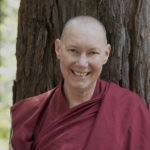 She is also a certified teacher in Compassion Cultivation Training, a program developed by Geshe Thubten Jinpa and colleagues at Stanford University. Venerable Tenzin joined the faculty at Land of Medicine Buddha in August 2018.